CBI - China: Day 124 of 142 of the 1st Battle of Hebei. Spain: Day 292 of 985 of the Spanish Civil War. Spain: Day 657 of 985 of the Spanish Civil War. CBI - China: Day 302 of 2,987 of the 2nd Sino-Japanese War. Day 87 of 124 of the Battle of Henan. CBI - China: Day 667 of 2,987 of the 2nd Sino-Japanese War. Day 49 of 54 of the Battle of Nanchang. Day 15 of 35 of the Battle of Suizao. Atlantic: German He-115s bomb the British sub HMS SEAL in the Kattegat, Norway. While evading the depth charges from anti-submarine trawlers, she hits a mine and begins to sink. ETO - Norway: Day 26 of 63 of the Battle of Norway. The last remaining 30,000 Allied troops begin an offensive to take Narvik from the Germans. CBI - China: Day 1,033 of 2,987 of the 2nd Sino-Japanese War. Day 172 of 381 of the Battle of South Guangxi. Day 4 of 49 of the Battle of Yichang. Germany: Adolf Hitler says in a speech that Winston Churchill is not a capable leader, neither on political nor military fronts. Atlantic: The German sub U-38 sinks the Swedish ship JAPAN off the coast of French Guiana. ETO - UK: Day 241 of 258 of the Blitz. German bombers attack Liverpool for the fourth consecutive night, killing 850 civilians so far. MTO - Malta: The Luftwaffe sinks the British minesweeper HMS FERMOY in dock at Malta. MTO - Libya: Day 25 of 256 of the Siege of Tobruk. The Axis offensive continues to stall so the order is given to lay siege instead. Middle East: Day 3 of 30 of the Anglo-Iraqi War in Iraq. The RAF makes a bombing raid on Baghdad. East Africa: Day 329 of 537 of Italy's East African campaign in the lands south of Egypt. The 29th Brigade of the Indian 5th Division launches another attack at Amba Alagi, Abyssinia, and captures 3 key hills. CBI - China: Day 1,398 of 2,987 of the 2nd Sino-Japanese War. CBI - Thailand: Day 216 of 221 of the Franco-Thai War (Vichy France vs Thailand). USA: Twenty-nine Navajo recruits board a bus at Ft Defiance, Arizona, to make their way to Marine Corps Recruit Depot, San Diego (MCRD,SD), to begin work on developing a communications code based on the Navajo language (the Code Talkers). 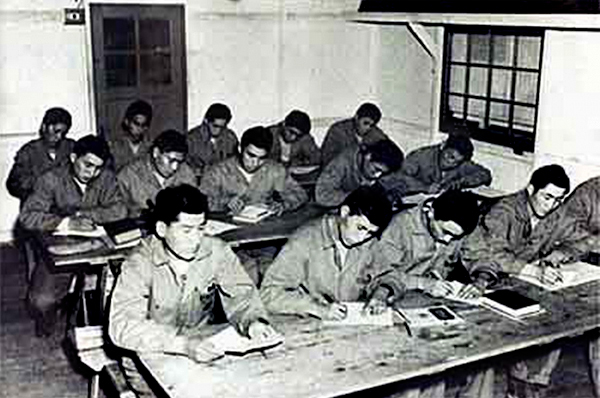 The name "Code Talkers" is strongly associated with bilingual Navajo speakers specially recruited during World War II by the Marines to serve in their standard communications units in the Pacific Theater. Code talking, however, was pioneered by Choctaw Indians serving in the US Army during World War I. These soldiers are referred to as "Choctaw Code Talkers." 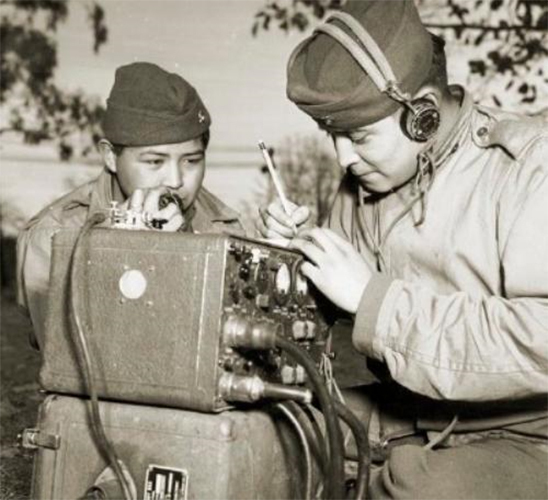 Other Native American Code Talkers were deployed by the United States Army during World War II, including Cherokee, Choctaw, Lakota, Meskwaki and Comanches. Soldiers of Basque ancestry were used for code talking by the US Marines during World War II in areas where other Basque speakers were not expected to be operating. Atlantic: Day 111 of 169 of Germany's Second "Happy Time," during which U-boats sink 609 Allied ships with little risk. U-564 damages the US freighter DELISLE just off the coast of Port St Lucie, Florida. U-507 sinks the US tankers NORLINDO, MUNGER T BALL and JOSEPH M CUDAHY off the Florida Keys. Russian Front - North: Day 239 of 872 of the Siege of Leningrad. Russian Front - North: Day 86 of 102 of the Battle of the Demyansk Pocket, another failed attempt to break the siege at Leningrad. Russian Front - North: Day 102 of 103 of the Battle of the Kholm Pocket. Another attempt to break the siege at Leningrad. Russian Front - South: Day 187 of 248 of the Siege of Sevastopol, Crimean Peninsula. CBI - Burma: Day 142 of 164 of Japan's Invasion of Burma. Japanese troops capture Bhamo while the British abandon Akyab on the Burmese coast. CBI - China: Day 1,763 of 2,987 of the 2nd Sino-Japanese War. PTO: The USS GAR sinks another Japanese ship in daylight after hitting her with a torpedo. PTO - Malaya: Day 75 of 357 of the Battle of Timor Island. PTO - New Guinea: Day 2 of 5 of Japan's Operation MO to take Australian New Guinea. PTO - New Guinea: US 5th Air Force bombs the airfields at Rabaul and at Lae. PTO - Philippines: Day 148 of 152 of the 1st Battle of the Philippines. An Additional 2,000 Japanese troops land on Corregidor. PTO - Solomon Islands: Day 2 of 2 of the Japanese invasion of Tulagi. The Japanese invasion fleet is attacked by US fighters off the USS YORKTOWN. However, the landing continues and the Japanese take the island. PTO - Solomon Islands: Day 1 of 5 of the Naval Battle of the Coral Sea. The US and Japanese carriers will clash for the next five days. Atlantic: After German sub U-625 spots an Allied convoy in the North Atlantic, a Wolfpack is organized which will sink seven British ships during tomorrow's attack. ETO - Belgium: US 8th Air Force B-17s bomb the former Ford and General Motors plants at Antwerp. ETO - Germany: The RAF night bombs on Dortmund, killing almost 700. ETO - Spain: The body of Glyndwr Michael is buried at the Cemetery of Solitude in Huelva, as Major William Martin of the British Royal Marines. He was the dead homeless man whose body was used to fool the Germans into thinking Greece was going to be invaded instead of Sicily. Russian Front - North: Day 604 of 872 of the Siege of Leningrad. Russian Front - North: Day 365 of 658 of the Siege of the Kholm Pocket. Russian Front - South: Hitler postpones Operation CITADEL, which ultimately gave the Soviets more time to prepare their defenses. This is considered to be one of his biggest blunders of the war. MTO - Tunisia: Day 169 of 178 of the Battle of Tunisia. The Luftwaffe evacuates from Tunisia. US 9th and 12th Air Forces provide air support. Middle East: The Vatican Secretary of State reminds the Apostolic Delegate in London that the Vatican is opposed to establishing a Jewish homeland in British Palestine due to the area's sacred status to Christianity as the birthplace of Jesus Christ. CBI - China: Day 2,128 of 2,987 of the 2nd Sino-Japanese War. CBI - Indochina: US 14th Air Force bombs at Hanoi, Haiphong, and Samah on Hainan Island. PTO - Alaska: Day 332 of 435 of the Battle of Kiska, Aleutian Islands. US 11th Air Force attacks targets at Attu. PTO - New Guinea: Day 13 of 148 of the 2nd Battle of Lae-Salamaua. US 5th and 13th Air Forces provide air support. ETO - France: US 9th Air Force B-26s and A-20s bomb gun emplacements and other military targets near the coast. ETO - Germany: US 8th Air Force heavy bombers are sent to bomb Berlin, Brunswick and other targets in central Germany, but the mission is recalled due to cloud cover. However, on the way back some of the B-17s bomb the Bergen/Alkmaar Airfield in The Netherlands. ETO - Hungary: The RAF carries out a night raid on Budapest. Germany: A new German plan calls for the deportation of 3,000 Hungarian Jews to Auschwitz Concentration Camp on a daily basis. Today a meeting is held in Vienna to determine how to achieve this operation. Russian Front - North: Day 93 of 191 of the Battle of the Narva Isthmus, Estonia. Both German and Soviet troops remain in their defensive positions. Russian Front - South: Day 27 of 35 of the Battle of the Crimea. Russian Front - South: Day 27 of 60 of the Battle of Romania, 1st Jassy Offensive. Day 3 of 7 of the 2nd Battle of Targu Frumos. MTO - Italy: Day 109 of 123 of the Battle of Monte Cassino. RAF and US Air Forces provide air support. The German Gustav Line continues getting weaker. MTO - Italy: Day 104 of 136 of the Battle of Anzio. RAF and US Air Forces provide air support. CBI - Burma: Day 61 of 166 of the UK's Operation THURSDAY. CBI - Burma: Day 56 of 147 of the Battle of Myitkyina. US 10th Air Force provides air support. CBI - Burma: Day 34 of 302 of the Chinese Salween Offensive. US 14th Air Force provides air support. CBI - China: Day 2,494 of 2,987 of the 2nd Sino-Japanese War. Day 18 of 259 of Japan's Operation ICHI-GO. Day 18 of 39 of the Battle of Central Henan, the first offensive in Japan's Operation ICHI-GO. Chinese continue retreating from central China. CBI - India: Day 58 of 118 of the Battle of Imphal-Kohima. Near Kohima, the British counter-attacks are repulsed by the Japanese. PTO - New Guinea: Day 66 of 80 of the Battle of the Admiralty Islands. 5th Air Force provides air support. PTO - New Guinea: Day 142 of 597 of the Battle of New Britain. US 13th Air Force provides air support. PTO - New Guinea: Day 13 of 481 of the Battle of Western New Guinea. PTO - Solomon Islands: Day 186 of 295 of the Battle of the Bougainville Islands. US 13th Air Force provides air support. Atlantic: Grand Admiral Dönitz, now the newly designated leader of the Third Reich, orders all U-boats to cease their offensive operations and return to their bases. ETO - France: Day 279 of 284 of the Battle of Brittany. ETO - France: Day 232 of 236 of the Siege of Dunkirk. ETO - Germany: US 9th Army accepts the surrender of the German 9th and 12th Armies and US 3rd Army accepts the surrender by Field Marshal Paul von Kleist. The US 7th Army occupies Innsbruck, Berchtesgaden and Salzburg. ETO - Germany: A large number of German forces in Denmark, The Netherlands, and northwestern Germany surrender to British Field Marshal Montgomery. British troops enter the Neuengamme Concentration Camp near Hamburg. Russian Front: The German ship ORION is sunk off Swinemünde, Germany (now Swinoujscie, Poland) by bombs. About 4,000 people, mostly refugees, are killed. Russian Front - Center: Day 202 of 206 of the Battle of the Courland Pocket in Latvia. Russian Front - Center: Day 19 of 23 of the Battle of Settin-Rostock, both sides of the border between Germany and Poland. Russian Front - Center: Day 2 of 6 of the Battle of Brandenberg, Germany. Russian Front - Center: Day 81 of 83 of the German Siege of Breslau (today Wroclaw, Poland). MTO - Italy: The US 5th Army reaches the Brenner Pass on the Italian-Austrian border without any opposition. CBI - Burma: Day 90 of 99 of the Battle of Pakokku and Irrawaddy River operations in central Burma. The war in Burma is pretty much over except for a few small pockets. CBI - Burma: Day 10 of 12 of the Battle of Rangoon. US 10th Air Force provides air support. The Indian troops begin mop up operations. CBI - China: Day 2,859 of 2,987 of the 2nd Sino-Japanese War. Day 34 of 91 of the Battle of Zhijiang. US 14th Air Force provides air support. Day 26 of 60 of the Battle of West Hunan (near Zhijiang). Japanese troops continue withdrawing from southern China. The USS TREPANG sinks the Japanese Minesweeper Number 20 in the Yellow Sea while the US sub USS LAGARTO is sunk by the Japanese minelayer HATSUTAKA in the Gulf of Siam. PTO - Dutch East Indies: Day 4 of 52 of the Battle of Tarakan Island. PTO - Japan: The HMS KING GEORGE V bombards the airfields in the Ryukyu Islands. PTO - Japan: US 20th Air Force B-29s attack the airfields at Oita, Omura, Saeki and Matsuyama on Kyushu and Shikoku Islands. PTO - Japan: Day 34 of 83 of the Battle of Okinawa. Kamikaze pilots sink 17 US warships in 24 hours off Okinawa. PTO - New Guinea: Day 494 of 597 of the Battle of New Britain. US 10th Air Force provides air support. PTO - New Guinea: Day 378 of 481 of the Battle of Western New Guinea. US 10th Air Force provides air support. PTO - Palau Islands: US 7th Air Force bombs AA positions on Koror Island while B-24s hit the airfield on Marcus Island in the northern Pacific. PTO - Philippines: Day 197 of 299 of the 2nd Battle of the Philippines, aka the Liberation of the Philippines or the Philippines Campaign. PTO - Philippines: Day 141 of 244 of the Battle of Luzon. 5th Air Force provides air support. PTO - Philippines: Day 56 of 159 of the Battle of Mindanao Island. 5th Air Force provides air support. PTO - Philippines: Day 48 of 135 of the Battle of the Visayas region. US 5th and 7th Air Forces provide air support. Recognizing the contribution of Navajo "code talkers," whose use of an unbreakable Navajo-language radio code was instrumental in defeating the Japanese, this film serves as an admirable tribute to those Native American heroes.